After posing a picture of his wild hair-do Kim Junsu has tweeted a new picture of himself dressed looking as pretty as any idol girl. 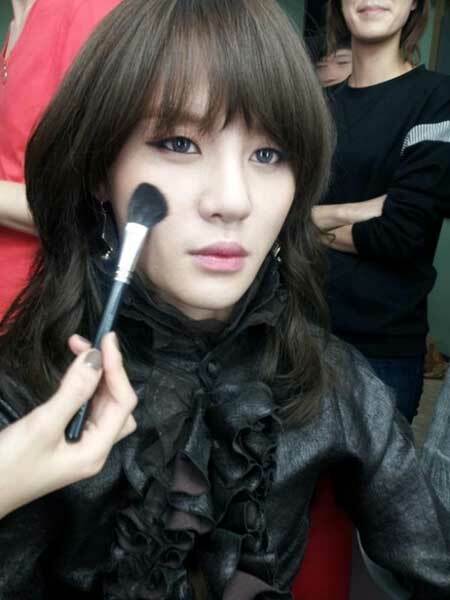 The tweeted picture showed Kim Junsu getting his makeup done while dressed from head to toe as a woman. In addition to color contacts, makeup and a long curly wig, Kim Junsu wore a black-patterned shirt in the picture. The picture was revealed to be from the past during his shoot for his music video Tarantellegra. In it, a brief glimpse of a mystery woman, revealed to be Kim Junsu himself, was seen. The tweeted picture was a close-up of his ‘feminine’ appearance in the music video. OMG!!!! SO THE PRETTY MYSTERIOUS WOMAN WAS…JUNSU?!DAMMIT!!! !